When diagnosed with Celiac Disease, your doctor will advise you to go gluten free. Continuing to eat gluten after being diagnosed can potentially harm your body further. There are many gluten free alternatives including gluten free bread, pasta, cereal, etc. There are also gluten free ingredients such as gluten free flour to make your own food, including your own bread. Celiac disease is known as an autoimmune disease. This means an individual with this type of disease should refrain from consuming a diet consisting of rye, barley, and wheat. Gluten is found in pasta and bread. However, there are many other types of food that can have traces of gluten. 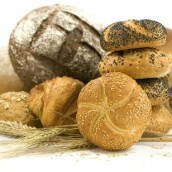 Gluten intolerance/celiac disease can lead to serious health conditions. First, a sufferer will notice sharp pains, fatigue, bloating, bone density loss, arthritis, anemia, diabetes, and many more symptoms. When this condition can lead to other serious, life threatening conditions is when gluten is still consumed when it shouldn’t be. What happens is the body begins attacking itself and will not be able to fight off any bad health issues. When your doctor suggests you go gluten free, you should follow his/her advice. Going against what the doctor says can impact your health significantly. Having the advantage of making your own gluten free food is a great option. Some gluten free food has a lot of fat so it’s advisable to check the nutritional facts and plan your diet accordingly.